Today when people speak of the "architecture of the modern movement," they are usually referring to the International Style - especially the gleaming steel, glass, and concrete forms of its most famous buildings. More of a movement than a mere aesthetic, the International Style emerged in Europe partly as a response to the cataclysm of World War I and related events. Its use in postwar housing gave it renown as a symbol of social and industrial progress, and not surprisingly, the International Style often resonated with leftist political groups. In the face of opposition from totalitarian regimes in the 1930s, many of the International Style's European proponents resettled in the United States, where economic expansion after World War II allowed it to flourish, particularly in skyscraper construction. This, along with the growth of rapid postwar intercontinental communication, allowed it to become a truly global architecture. But the inability of the International Style's supporters to solve social problems as its founders had hoped, coupled with its rigid formal monotony, prompted many architects in the 1960s to seek new design directions that reflected an increasingly diverse, commercialized, and post-industrial society. While few architects today call themselves adherents of the International Style, an equally small number would say it has not in some way influenced their work. The International Style is often thought of as the "architecture of the machine age," which symbolized for many the crystallization of modernism in building design. This became particularly true after World War II, when the postwar economic building boom made the International Style a kind of "unofficial" American architecture. Often called "minimalist" architecture, International Style buildings are well-known for the way they seem to strip away all extraneous ornament from the structure, leading to an extreme blurring of interior and exterior space, the exposure of buildings' construction with unvarnished honesty, and the glorification of modern industrial materials: chiefly, steel, concrete, and glass. The International Style was one of the first architectural movements to receive renown and be adopted unequivocally on every inhabited continent. It became a global symbol of modernity both before and after World War II, especially in Latin America and Asia, where nations felt a keen desire to industrialize and compete politically and economically with traditional powers in Europe and North America. The term "International Style" was coined in 1932 by an eponymous exposition of European architects at the Museum of Modern Art in New York curated by Henry-Russell Hitchcock and Philip Johnson to describe an ethos of construction purely in terms of materials and space, with virtually no reference to the sociopolitical dimension, as had been highly emphasized in Europe. This differentiated the International Style between its understanding in Europe versus in the USA. The International Style arose from several strands of architectural and political thought in the 1910s. First, it often has been said to have grown out of a fascination with buildings for a modern industrialized age, especially factories and warehouses, which demanded utilitarian designs that included ample natural lighting and flexible interior space for machinery or storage for huge quantities of items, with minimal ornamentation of the structure. Such structures also spoke to the efficiency of construction and the solidity of materials. In Germany, such thought was visible in the steel-framed turbine factory in Berlin for Allgemeines Elektrisitäts Gesellschaft - the German General Electric - designed by company architect Peter Behrens between 1907 and 1910. At the time, Behrens simultaneously employed three seminal figures in the history of the International Style: Walter Gropius, Charles-Édouard Jeanneret (later known as Le Corbusier), and Ludwig Mies van der Rohe. Soon afterwards, Gropius left Behrens' office and opened his own practice with Adolf Meyer; they immediately received a commission for the new Fagus Shoe Factory at Alfeld-an-der-Leine in 1911, whose large glass curtain walls would be equally as inspiring for progressive architects. Home to the state-supported school for the applied arts, the Bauhaus was founded in Weimar in 1919 by Walter Gropius, but moved to Dessau in 1925 when political conditions in the latter became more favorable to its left-leaning educational climate. Gropius designed the school's new permanent home along with the faculty residences nearby that same year. The pinwheel-plan institutional building is composed of an asymmetrical set of prismatic structures of reinforced concrete. Each section - dormitories, studio spaces, offices, and refectory - uses a different design that delineates its respective function with remarkable clarity, particularly the use of massive glass curtain walls for the studio spaces to maximize the admittance of natural light. The wraparound corners of these windows, which emerge from the plane of the rest of the facade, enable one to see through two sides of the structure simultaneously, a feature that prompted architectural critic Reyner Banham to call it the first "Cubist" building. The complex only housed the Bauhaus for four years before the political climate became untenable and it moved to Berlin, closing for good under Nazi pressure in 1933. The Villa Savoye is the last of Le Corbusier's houses that he designed during the 1920s, and fittingly is considered the summation of his "Five Points of a New Architecture" elucidated in his treatise Vers une architecture (1923). The pilotis, or thin point-support columns, are arranged in a near-perfect grid that provides the architect almost complete freedom in the designs of both the floor plan and the facades. The second floor, the main living space, is characterized by the ribbon windows that provide unencumbered views of the landscape - fostering the strong connection between nature and the machine - and it is crowned by a roof terrace. 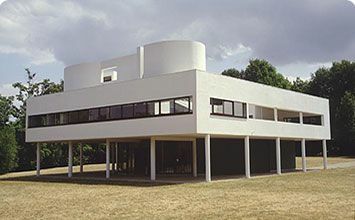 Built entirely out of the industrial materials of steel, concrete, and glass, the Villa Savoye exhibits several links with the modern means of transportation that fascinated Le Corbusier. The terrace features a sculptural wall whose curved forms echo the smokestacks of ocean liners, a relationship which is underscored by the placement of the house within a large lawn, much like a ship sailing through a vast sea; and in the metal ship-deck railings of the ramps that connect the house's three levels. Meanwhile, the curve of the driveway as it snakes around the first level uses the exact turning radius of a 1929 model Voisin - the automobile manufacturer that had supported Le Corbusier's work throughout the decade. The villa thus represents the way Le Corbusier conceived of a dwelling as "a machine for living." Mies and Lilly Reich together designed the German Pavilion for the 1929 World's Fair in Barcelona - a structure which now ranks among the most significant temporary structures ever built, particularly for an international exposition. Demolished after the fair, it was reconstructed in 1986 using the original plans, now in the collection of the Museum of Modern Art in New York. It constitutes Mies' most succinct statement in the reduction of a building to the minimal requirements to define space: a handful of columns elevated on a platform juxtaposed with asymmetrically-arranged opaque and transparent wall planes, supporting a flat roof. The Pavilion functioned during the fair as simply a reception space for dignitaries, as the Weimar government had other space for actual exhibits. Though there is an extreme emphasis on horizontality, the platform of travertine (a common stone used in ancient classical monuments) elevates it much like a Greek temple, with a structural clarity to match. But also here we see the fineness of materials: the cruciform-plan steel columns are chrome-plated, and the interior is ornamented solely with a red curtain, while the colored onyx walls are cut to expose the diamond pattern, all of which recalling an attention to refinement and craftsmanship that is balanced with the building's clear machine-made qualities. It therefore exemplifies the visual form of Mies' famous dictum, "Less is more." The International Style proved to be a perfect idiom for the new, modern building type of the roadside automobile filling station. Both of these structures were included in Hitchcock and Johnson's book The International Style that followed the pair's landmark exhibition of 1932 at the Museum of Modern Art. They demonstrate the ideal way in which essentially miniature industrial buildings serve a simple, functional purpose. They consist of individual pavilions distinguished by large expanses of glass curtain walls set into a steel structure, topped by a flat roof; in the case of Borkowsky's station (top), the pumps are even covered by a cantilevered canopy. Eschewing all exterior ornament, the stations suggest the minimal, economical use of industrial building materials to serve the simple utilitarian purpose of refueling cars efficiently. This efficiency is only enhanced by the clarity of structure and volume in each station, which also communicates the transparency and honesty of the business. Their construction forecasted the mushrooming popularity of these structures in the postwar era, which (especially in North America) was specifically designed around the widespread use of the automobile as the primary means of everyday transit. In essence, the most important aspect of these two gas stations is their role in establishing the tenets of a particular modern building type, which has remained virtually unchanged to the present day. The PSFS Building was the only significant structure to come from the short-lived partnership of Howe & Lescaze, but it gave both men architectural immortality. The brainchild of the Swiss-born Lescaze, who had immigrated to the USA in 1920 and kept in tune throughout the decade with progressive European architectural currents, the PSFS Building was the first International Style skyscraper to be built in the USA, the birthplace of the building type. It was also the first tall building in the country to be air-conditioned, a necessity when it opened in humid central Philadelphia on August 1st, 1932. Climatization represented just the tip of the iceberg of the building's innovative character. It was a radical departure from the traditional symmetrical classicism of bank architecture, with a tower using a T-shaped plan supported on a base of retail shops at street level. The double-height banking hall on the second floor, with a curtain wall of windows, was reached by escalators, and a streamlined aesthetic that combined polished steel, brick, wood, and expensive stone exuded a distinctly modern corporate identity. At the top of the tower, the giant "PSFS" neon sign in sans-serif typography symbolized the institution's efficiency, energy, and power, and even today it remains a linchpin of the Philadelphia skyline. Too radical to set a trend at the outset of the Great Depression, the PSFS Building would not be followed by another International-Style American skyscraper until after World War II. The construction of the headquarters of the United Nations, an organization that represented a desire for international cooperation instead of competition in the new post-World War II global order, was itself a highly symbolic process. It was mirrored by the choice of architects, which consisted of an international design team of twelve architects, including Le Corbusier and Oscar Niemeyer, headed by the Americans Wallace Harrison and Max Abramovitz. While each architect submitted his own design, ultimately a hybrid between Niemeyer and Le Corbusier's two proposals was chosen after much lobbying by the Swiss architect for his design to be built, though the actual constructed version was closest to Niemeyer's scheme. The original complex, which has been expanded significantly in subsequent years, is renowned for the clarity of its conception, with three structures on the long site between First Avenue and the East River in midtown Manhattan: a low, horizontal block of meeting rooms, the tall Secretariat tower of offices, and the fan-shaped General Assembly building, surrounding an open plaza that arguably symbolizes the intermingling of cultures and nations. The explicit functional shape of the Assembly building suggests the democratic nature of the institution, while the office tower, raised on pilotis, exemplifies the sense of order, integrity, and transparency of the UN's operations. As one of the first International Style skyscrapers built after the war, it became a prototype for the architectural identity of corporations and institutions in the USA and elsewhere, aiding greatly in the dissemination of the International Style as the architecture of the modern postwar world. The construction of the city of Brasilia as Brazil's new capital in the 1950s was a milestone for the country, as it sought to move the government to a new centralized location, away from Rio de Janeiro, Brazil's old capital on the Atlantic coast tied to its colonial past. The opportunity to begin anew on an undeveloped site likewise represented an opportunity to elevate Brazil's global image as a nation on par with the traditional Western powers. International Style architecture and planning for the new capital was seen as the visual crystallization of this ascendancy, and entrusted to the architects Lucio Costa and Oscar Niemeyer, both longtime admirers of Le Corbusier, who had welcomed the Swiss architect to Brazil in the 1930s. Costa and Niemeyer's plan of Brasilia was laid out using two grand axes, one running roughly east-west - along which ran the governmental buildings - and one curved like a reverse C that crossed the first axis at the center, along which ran the commercial and residential districts. The layout thus appeared like the body of an airplane seen from above, fitting for a city born at the beginning of the jet age and reachable from the world beyond chiefly by airplane. (The airport was placed at the south end of the curved axis.) Prismatic steel-and-glass skyscrapers surrounded by ample green space characterize nearly the entirety of the building program, from housing to government ministries. In retrospect, the scheme for Brasilia, however, created numerous problems. The plan's massive scale anticipated that all practical ground transportation would take place by car or bus on broad boulevards, which has invited circulation problems, pollution, and precluded the use of other forms of transit. This scheme produces an endless (and arguably disorienting) monotony and, particularly in the giant apartment blocks, divides inhabitants into uniform cells that are disconnected from public space, thereby destroying a sense of community. The Chase Manhattan Bank tower was the first International Style skyscraper to be constructed in lower Manhattan, where tall buildings traditionally had used a variety of revivalist and picturesque styles. Both its aesthetic and the choice of Skidmore, Owings & Merrill as the architects exemplify the corporate identity that modern architecture came to represent during the 1950s in the United States. Shown here are then-president David Rockefeller's office (at top) and employee desks in an individual department. Just as the exteriors of International Style skyscrapers came to embody the precision of the modern machine age, with their stark rectilinearity and structural clarity, their interiors likewise exemplified an ordered corporate environment. The point-support skyscraper structure allowed for the maximum flexibility of interior space for employee work areas, which were often subdivided with gridded moveable partitions, sometimes even creating private offices. Austere metal desks arranged in precise rows embody the sense that the corporate workforce, which arrived and departed by the clock, constituted a well-oiled machine that processed transactions with ease, regularity, and transparency. Recessed lighting throughout the building accentuates the large axial expanses of space. Rockefeller's own office, while clearly more comfortable, nonetheless exudes a sense of restraint and precision that harmonizes with the rest of the building's interiors. Even the padded chairs, couch, and coffee tables are arranged in a precise grid, accentuated by the rather spare decor, including the rectilinear modern painting on the far wall. The unity between these two interiors thus suggests that the tight sense of structure, protocol, and efficiency is seamless from the top of the corporate ladder to the bottom. The Stahl House is one of the most recognizable residences in the Case Study House Program, the experimental series of modern houses in southern California sponsored by and featured prominently in John Entenza's Arts and Architecture magazine between 1945 and 1962. Its design exemplifies the program's commitment to exploring the use of modern industrial materials in designing single-family residences. The L-shaped steel-frame structure, perched on a cliff overlooking Los Angeles, was the brainchild of Pierre Koenig, one of the region's young, up-and-coming architects who designed multiple houses for the latter stages of the Program's run. The key feature of the interior of the Stahl House is, ironically, the way in which the building dissolves as much as possible the line between interior and exterior, most dramatically seen in the living room wing that cantilevers over the edge of the cliff and is enclosed by curtain walls on three sides. The corrugated steel of the ceiling continues uninterrupted from the exterior patio to the interior. The slightest distinction is made between rooms, with a central fireplace marking the center of the living room, which flows seamlessly into the kitchen, all of which is made possible by the spans created by the steel frame, while the low furniture provides the minimal definition necessary for the interior spaces to function. Together, the clarity of minimal structure and maximum spatial flow make the Stahl House one of the best examples of an International Style interior.